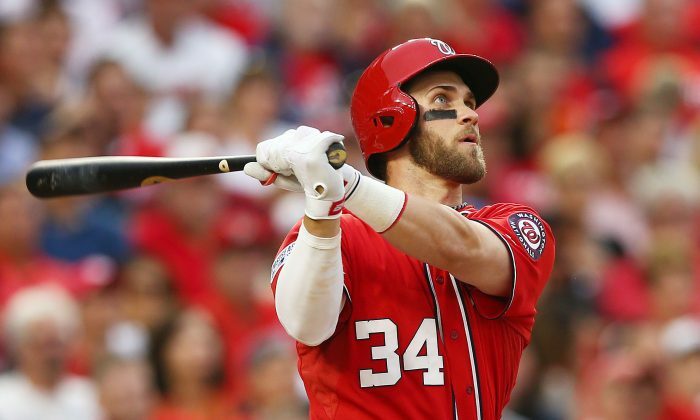 Washington Nationals star outfielder Bryce Harper can’t go far in the D.C. area without being noticed—or at least you wouldn’t think he could. Monday, the National League’s reigning MVP visited the Smithsonian on his team’s day off and took a selfie with an unsuspecting fan (whose back is turned) and posted it to Instagram. Harper probably can’t go far without seeing his name somewhere. The 23-year-old former first-overall pick of the 2010 MLB Draft hit a league-high 42 home runs last season and drawing 124 walks while posting a batting line of .330/.460/.649 (average/on-base/slugging). This year he’s picked up right where he left off last season with nine home runs, 23 RBIs—both are MLB-bests—and a batting line of .323/.405/.855. The major difference is that the Nationals have a 14–4 record through Sunday. Last year the team was a disappointing 83–79.